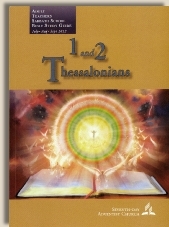 Today’s lesson is purportedly concerned with the birth of a church, specifically, the church founded in Thessalonica. Yet, as we examine the Quarterly lesson we see that 'class makeup’ of this church to be the real topic. The Quarterly lesson author apparently assumes that since these Christians 'turned to God from idols’ they must not have been Jews. Apparently the assumption is made that since Paul instructed them to 'work with your hands’ this shows that the church was made up of working class people. Whether or not the Thessalonian church was made up primarily Gentiles or Jews or if they were of the laboring class or professionals or leaders of the community really is of no significance in God’s plan for the evangelization of the world. What is really revealed here is the bias of the Quarterly lesson author in placing such importance on these 'classes of people’ so as to identify them as such on such flimsy assumptions not clearly stated in scripture. The appeal to Acts Chapter 17 and claiming 'the Jewish, and relatively wealthy’ as makeup of the original church which must have changed by the time Paul wrote 1 Thessalonians simply adds assumption upon assumption and further exposes this bias. When you read Paul’s introductory greeting in 1 Thess. 1:1-7 you get the clear impression he is addressing the very same Believers he originally preached the gospel message to. While it isn’t absolutely wrong to refer to the establishment of a new congregation of believers in a new location as 'the birth of a church’ we should keep in mind that the Church (the Body of Christ, also known as the Bride of Christ) had only one literal birth and that occurred at Pentecost while the existing followers of Christ were gathered together in Jerusalem awaiting the arrival of the Holy Spirit to come upon their lives as promise by the Lord. When individuals are 'born again’ they become members of this universal Body of Christ which is the Church by the indwelling Holy Spirit. A local church is simply a congregation of members of this universal church who worship together at a certain place. To broach the topic of the 'class makeup’ of those who form the body of Christ exposes the anti-Christian bias of the person doing so. In God’s view there are only two classes of people. At the return of Jesus Christ to claim his bride they will either be sinners who have been redeemed by the blood of Jesus Christ or they will be enemies of the cross. While there are exist many local congregations of Holy Spirit indwelt Christians there has only been one true birth of the Church which happened at Pentecost in Jerusalem nearly two thousand years ago shortly after Jesus Christ ascended into heaven and sat down at the right hand of God the Father.